This one of the first Traveller's notebooks I made last year when I purchased a gorgeous South American hide from my leather merchants. It was a bit of a one off special, very popular, and as yet, not repeated, as my hides are now all Italian. The unusual and special thing about this hide was the branding, and I couldn't resist making myself my dream traveller's notebook/wallet/calendar all in one book. I've been using it for almost a year now, with two Moleskine pocket size squared notebooks, two little plain paper books that are very small and will be swapped out soon as the paper is falling out of them. I also have a little diary/calendar insert which I bought from my local stationers, and covered with some pretty paper. Last month I finally ordered a wallet insert from Keely Reichman on Etsy - check her shop out here . The inserts are made out of a Trader Joe's reusable bag, and are so affordable at around £13. I didn't have to pay any import duty as it is the size of a letter. The material is kind of crinkly canvassy shopping bag stuff...I'm not familiar with a Trader Joe bag, so I didn't know what to expect. Keely's shipping times are around 2 weeks, so I was surprised when the item arrived much faster than expected, and I'm happy to say that it is a really great addition to my notebook. The most important feature for me was the zipper pouch for my coins, and this works great and looks sturdy enough to last. The little pouches on the side of the zipper pouch, which you can see in the picture with my stamps in, are handy for receipts and small items. I had hoped they would be suitable for credit cards, but although they fit in, they stick out quite a way and slip out easily. I keep my notes on the other side in the kraft-style insert. To get around the credit card thing I've used my Midori TN sized credit card insert with the bottom section folded up. I just can't justify buying anything else this month! I will buy the correct size as this one is a bit too wide, and hangs over the edge of my Minidori, which is actually extra wide. Mind you, credit cards are a set size, so even the correct size will be the same width? I need to do some research! I get my Moleskine notebook inserts from Amazon, around £7.00 for 3. They are little notebooks with a card-type soft cover, which has a little pocket in the back. The last few pages are tear-out, which is useful. The paper is sturdy and copes well with my habit of decorating it with watercolours and Distress Stains, washi tape and sticking stuff in. There is the choice of plain, lined, or squared paper with Moleskine... they dont do a dot paper yet. I prefer squared paper myself as my writing is atrocious and the little squares help to keep it tidyish, and are great for drawing. They have no margins like lined paper, which always reminds me of school, and feels restrictive and not conducive to creativity...but that's just me. 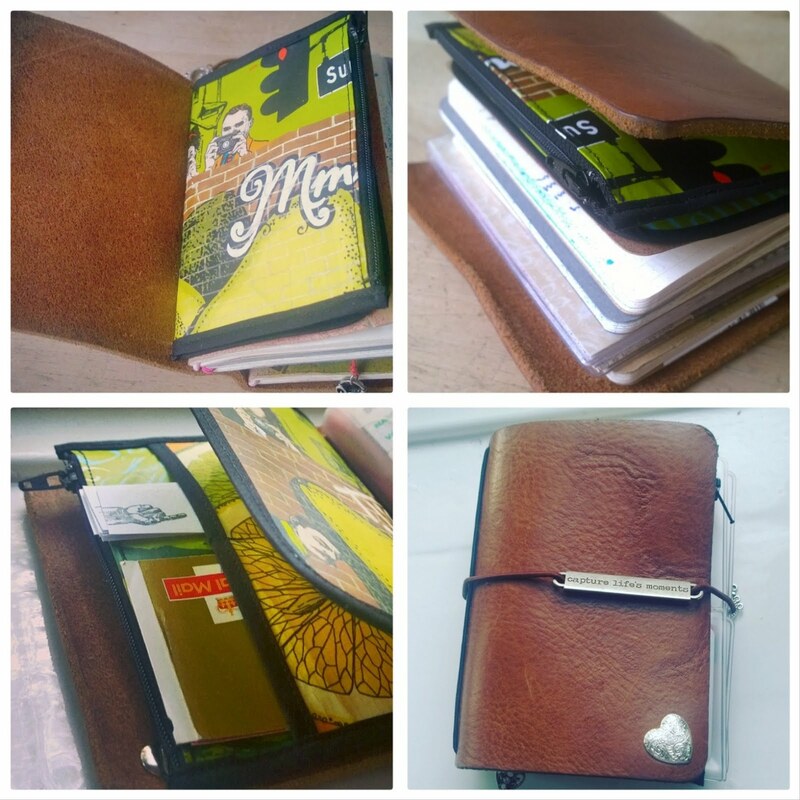 I use one of my notebooks in the Mini for notes on my work as a breastfeeding peer supporter. I work with an IBCLC and am constantly learning so I like to jot interesting things down to help me remember them. Also things that I use a lot, like volumes of milk in the early days and colour of nappy contents and that kind of stuff! the other notebook is for blogging and You Tube ideas. I have another one for day-to-day journaling on the go. My usual daily journal is something I keep and use only at home, so I have this for emergencies like being stuck in the car waiting for someone and finding I really need to write. 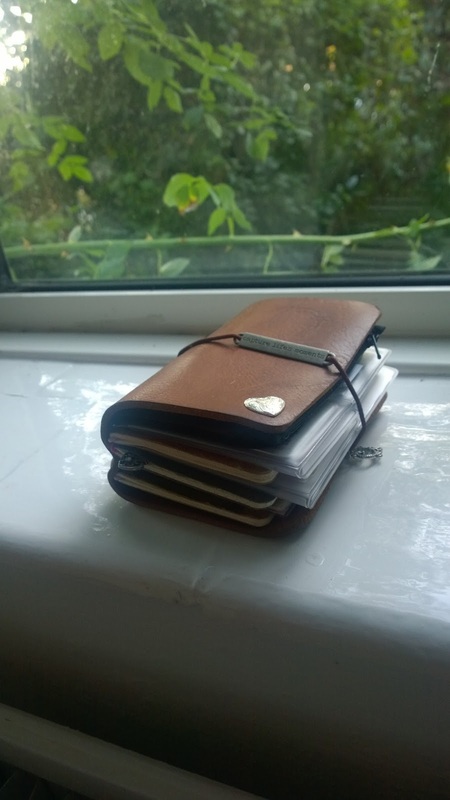 The smaller books contain notes about journals I'm making, dimensions and such like. Jils Wild LIfe on Etsy opens again after the summer break on the first of September, with some sumptuous new Italian leather Travellers Notebooks in four sizes...lots of work going on at the moment to be ready.